Met upon arrival at the DELHI airport and transfer you to your hotel. Overnight stay at hotel. Sightseeing of Old Delhi and New Delhi. Evening is at leisure and overnight stay at hotel. Morning drive to Jodhpur and check into hotel. Jodhpur is called the "blue city" owing to most of its houses being painted a beautiful shade of blue. In the afternoon visit Mehrangarh Fort dating back to the 15th century. visit to Meherangarh Fort - one of the most impressive in the whole of Rajasthan. Also visit Jaswant Thada - the Royal Cenotaphs. Overnight at hotel. Sightseeing tour of Udaipur in the morning including City Palace. This romantic city famed for its lovely palaces and lakes. Later visit the Garden of Maidens "Sahelion-ki-bari'. Afternoon boatcruise on the placid waters of Lake Pichola for views of the city of Udaipur as it rises majestically above the lake in the middle of the Rajasthan desert. Morning drive to Pushkar and enroute after stopping at Ajmer and Dargah reach Pushkar and check into your hotel. While Pushkar is a city of pilgrimage with over 500 temples and ghats, it is also famous for its annual Camel Fair, held during October/November. Visit temples and stay overnight at hotel. Visit the most famous Brahma Temple, said to be only temple in the world dedicated to this deity. Later drive to Kishangarh primarily known for its world famous miniature paintings and handicrafts and for the largest marble and granite cutting industry in the Country. Visit the palace gardens which are a home to flamingos, pelicans, wild duck and the Sarus Crane. Continue your drive and upon arrival check-in at hotel in Sarika wildlife sactuary for the overnight stay. Early morning exciting jeep safari into the Sariska sanctuary to view wildlife. Afternoon drive to Delhi (180 kms). Upon arrival in Delhi - check-in at hotel for the overnight stay. 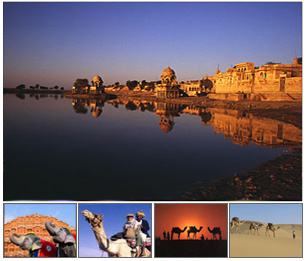 Enjoy your India tours in a land of rippling sand dunes, grand Rajasthan palaces and majestic forts. Stay at exotic palace hotels on your Luxury Golden Triangle Tour and experience the luxury of being treated like a Maharaja.